Just about to get your season started? Want to add a bit more spice to your tactical game? Here are four different tactical plays to consider. Two are backs plays, one of which can mix forwards and backs. The other two are team plays to break down organised defences. The Heads up back play is based on a box formation. The idea is that the pivot player, who is normally the fly-half, has three passing options. However, since it is one pass play, it reduces the risks of mistiming a run. You can put a forward into one of the “box” positions too, so it’s a good first and second phase play. 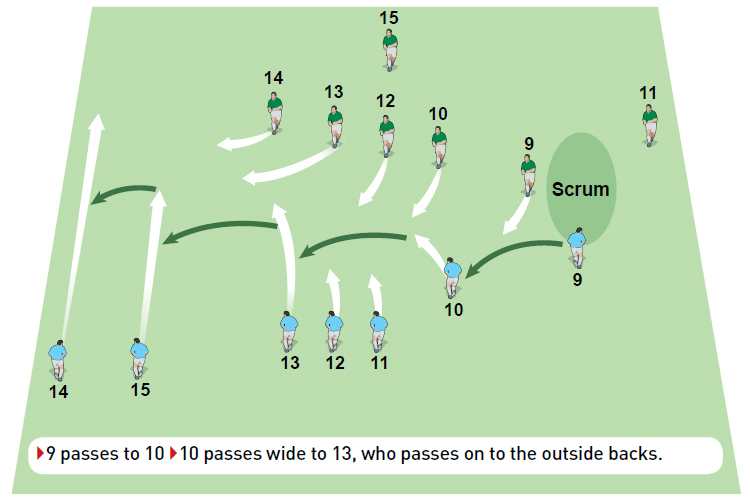 The Backs play: DS Split 15 is a particular favourite of mine because I loved it when I got a chance to play fullback. Like the box formation play (above) it can have three options and only involves one pass. Glenn Delaney, who now coaches Mitre Cup team Canterbury in New Zealand, shows us how to Shorten their defensive line. His tactic is great to use when the defence is organised because it creates a dent and then plays from there. It will become a stock play in your playbook. Finally, we look at a tactic used by Italy to disrupt a well-organised Ireland defence in the Six Nations, which we call Italy scrum wide box to beat backfield defence. Former England backs coach, Brian Smith, spotted this play, which pulls the Irish backfield defence out of position. Use his detail to help players fully understand their roles in a play. There’s a killer play from the final set up, but also other options depending on the shape of the defence.